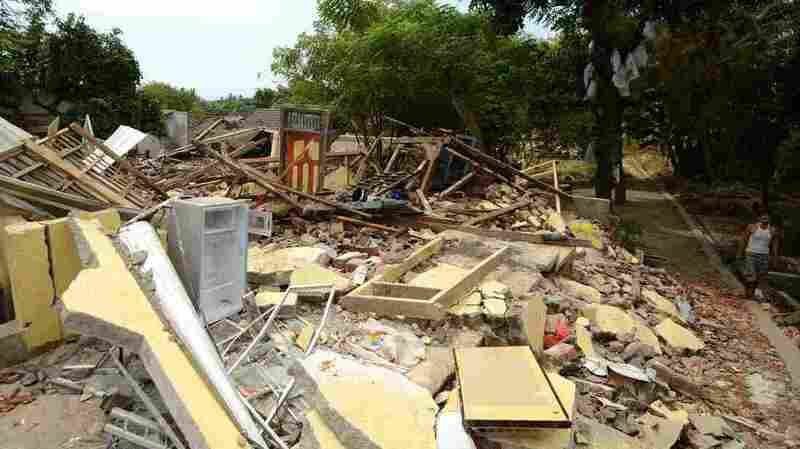 Death Toll For Indonesian Quake Rises Into The Hundreds Damaging aftershocks continue to shake the island of Lombak, which suffered a deadly earthquake on Sunday. Rescue workers are struggling to reach the injured in some remote areas. A man walks past collapsed houses in Kayangan, on the Indonesian island of Lombok, on Thursday. A devastating earthquake on Sunday killed hundreds, and a strong aftershock on Thursday caused panic among evacuees. "Casualty figures vary widely at the moment, and rescuers continue to comb through the rubble for survivors," NPR's Anthony Kuhn reports. "The quakes have left hospitals crowded with around 1,500 injured, and thousands of displaced are living in temporary shelters, or in the rubble of homes," he says. "The military has delivered food, water and medicine, but they're still in short supply in some parts of the island." Lombok experienced another earthquake on Thursday, an aftershock of magnitude 5.9. The Thursday quake destroyed buildings and caused more injuries, according to several reports. It was one of hundreds of aftershocks since the original earthquake on Sunday; more are expected to hit in the days to come. "Falling rubble instantly paralyzed Mary Andoni from the waist down when Indonesia was shaken by one of its deadliest earthquakes in years. But there was nobody in her destroyed village to get her the help she needed. There were too many other injured and dead. "On Thursday, paramedics finally evacuated Andoni to a hospital in the city of Mataram. But her story underscores the challenges facing this devastated region: Four days after the earthquake killed hundreds of people and displaced 270,000 more, injured survivors in remote areas cut off by landslides and broken bridges are still emerging from the ruined countryside, struggling to reach the doctors they desperately need."